We gather on the evening of the winter solstice, the meeting place between the shortest day and longest night. This is a powerful time to meditate on our soul's purpose, that which illuminates us from within and strengthens us when facing darkness. In our card reading, we call on our inner knowing, intuitive instincts, and animal wit to guide us to our internal center of peace, which will carry us safely through the cold and dark months ahead. 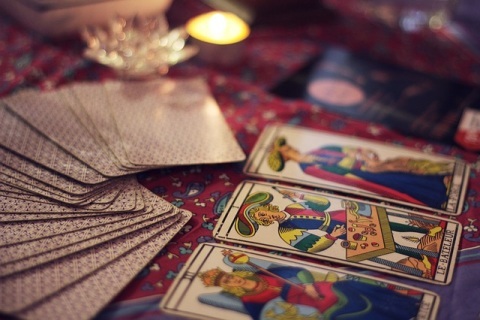 So, how about an evening of magic, play, and inspiration using oracle cards to uncover the wisdom within? We begin by posing questions about what's showing up in our lives right now and about moving through winter with ease and nourishing rest. Then we pick cards from decks that explore nature, chakras, and more. We take time to reflect on our cards, draw insights, and meditate on what it all means for each of us. Prepare for FUN! Light refreshments served. No previous experience necessary. Please bring a journal and pen for your notes. Date & Time: Friday, December 21, 2018, 6:30 - 8:30pm. Props/Clothing: No special clothing or props needed. It is recommended you wear clothes that are comfortable for sitting on chair or rug. Cost & Registration: $50 (see cancellation policy below). Space is limited for an intimate group. Register and pay below to secure your spot. Location: The Spectrum Center for Natural Medicine is located at 8555 16th Street, Suite #402, Silver Spring, MD 20910. How about an evening of magic, play, and inspiration using oracle cards to uncover the wisdom within? We'll pose questions, pick cards, and integrate insights. Friday, Dec 21, 2018 6:30-8:30pm @ The Spectrum Center for Natural Medicine, 8555 16th St., #402, Silver Spring, MD 20910. Light refreshments served. If, for any reason, Shira elects to cancel the workshop, you will receive a full refund. This situation is highly unlikely, but emergencies do happen. If you elect to withdraw from the workshop more than a firm 72 hours prior to the workshop, you will receive a full refund. If your space in the workshop is filled by another participant, you will receive a full refund, minus a $5 administrative fee. The refund will be made after the workshop if your space in it is filled. If your space is not filled, you will be notified by email that no refund will be given. If there are exigent circumstances (i.e. sudden severe illness, death in the immediate family, etc.) you may apply for a refund by informing Shira of the circumstances. This information will be reviewed and a decision made on a case-by-case basis. You will be notified by email of the decision. If approved, you will receive a full refund minus a $5 administrative fee.